The public has a more positive than negative view of Israeli Prime Minister Benjamin Netanyahu ahead of his address to a joint session of Congress next week. About four-in-ten (38%) have a favorable opinion of the Israeli leader, compared with 27% who hold an unfavorable view. Roughly a third (35%) express no opinion of Netanyahu, including 23% who say they have never heard of him. Netanyahu will address Congress on March 3 at the invitation of House Speaker John Boehner and congressional Republicans. Netanyahu is better known – and viewed much more favorably – among Republicans than among Democrats or independents. 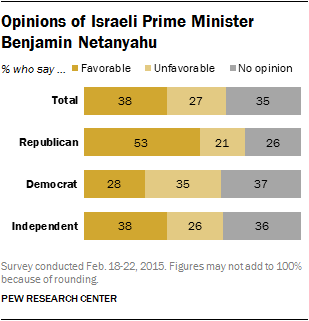 More than twice as many Republicans view Netanyahu favorably (53%) as unfavorably (21%); 26% have no opinion. By contrast, Democrats hold mixed views of Netanyahu (28% favorable vs. 35% unfavorable); 37% have no opinion. Independents’ opinions of Netanyahu mirror those of the overall public (38% favorable, 26% unfavorable, 36% no opinion). The new survey by the Pew Research Center, conducted Feb. 18-22 among 1,504 adults, finds little change since 2012 in opinions about U.S. support for Israel. Overall, 48% say that the level of U.S. support for Israel is about right; 29% say the U.S. is not supportive enough of Israel, while 18% say it is too supportive. In October 2012, 41% said U.S. support for Israel was about right, 25% said the United States was not supportive enough and 22% said it was too supportive. Currently, 54% of Republicans say the U.S. is not supportive enough of Israel; 36% say U.S. support is about right and 7% say it is too supportive. A majority of Democrats (55%) view the level of U.S. support for Israel as appropriate; 26% say it is too supportive, while 15% say it is not supportive enough. There have long been wide differences among religious groups in opinions about Israel, with white evangelical Protestants consistently expressing more support for Israel. Last August, 59% of white evangelical Protestants said they sympathized with Israel “a lot” in its dispute with the Palestinians. No more than about a third in other major religious groups expressed a great deal of sympathy for Israel. These differences also are reflected in the current poll: 55% of white evangelicals think the United States is not supportive enough of Israel. Among other groups, majorities or pluralities say U.S. support is about right. People who have no religious affiliation are more likely than other adults to say the U.S. is too supportive of Israel; 31% of the religiously unaffiliated say this, at least double the share of any other group. Still, nearly half the religiously unaffiliated (49%) view U.S. support for Israel as appropriate. Religious affiliation and partisanship are strongly associated. White evangelical Protestants are far more likely to affiliate or lean toward the Republican Party than those in other religious traditions (75% in the current survey) and this accounts for a significant amount of the differences between religious groups in their in views on U.S. support for Israel. Nevertheless, religious affiliation is independently associated with these views. Among Republicans and Republican leaners, white evangelicals are more likely than those of other religious traditions to say the U.S. is not supportive enough of Israel: 66% say this, compared with 46% of Republican white mainline Protestants and 49% of Republican white Catholics. The current survey does not include a large enough sample of Jews to analyze. Jewish views on this question can be found in the Pew Research Center’s 2013 survey of Jewish Americans. In that survey, conducted February-June 2013, 54% of Jews said U.S. support for Israel was about right, 31% said the U.S. was not supportive enough and 11% said it was too supportive. Among Republicans, conservatives are especially likely to have an opinion of Netanyahu and to rate him highly. Nearly six-in-ten (59%) conservative Republicans have a favorable impression of Netanyahu, while only 18% have an unfavorable view. Roughly a third of conservative Republicans (35%) have a very favorable impression of Netanyahu, by far the highest share of any partisan group. By contrast, only about a third of moderate and liberal Republicans view Netanyahu favorably (3% very favorably) and about as many (29%) view him unfavorably. Democrats also are divided ideologically in their opinions of Netanyahu: By about two-to-one, more liberal Democrats have an unfavorable impression (43%) than a favorable impression (20%) of the Israeli leader. Liberal Democrats are the only partisan or demographic group in which negative opinions surpass positive views. Conservative and moderate Democrats have mixed opinions of Netanyahu (35% favorable, 30% unfavorable). Among religious groups, white evangelical Protestants have the most favorable impressions of Netanyahu (50% favorable, 17% unfavorable). The Israeli prime minister is viewed more favorably than unfavorably among white mainline Protestants (43% favorable, 24% unfavorable) and among white Catholics (42%, 29%). People who are religiously unaffiliated are as likely to have an unfavorable view of Netanyahu as a favorable one (33% vs. 32%). There are no significant differences in opinions of Netanyahu by religious tradition among Republicans and Republican leaners. Across most partisan and religious groups, relatively large shares do not express an opinion of Netanyahu. Even among conservative Republicans, who are among the most likely to have an opinion of him, nearly a quarter (23%) do not. Among demographic groups, particularly large shares of women (41% no opinion of Netanyahu), adults under 30 (45%) and those with no more than a high school education (40%) are among the most likely to not express an opinion of Netanyahu. The share of Americans not offering an opinion of the Israeli Prime Minister is largely made up of those who are unfamiliar with him. Overall, 35% say either they have never heard of him (23%) – the predominant response – or can’t rate him (10%) or simply decline to answer (3%). The percentages saying they have never heard of Netanyahu are higher among women than men (27% vs. 19%), those under 30 years of age compared with those 65 and older (37% vs. 12%), and those without college experience compared with college graduates (29% vs. 13%).